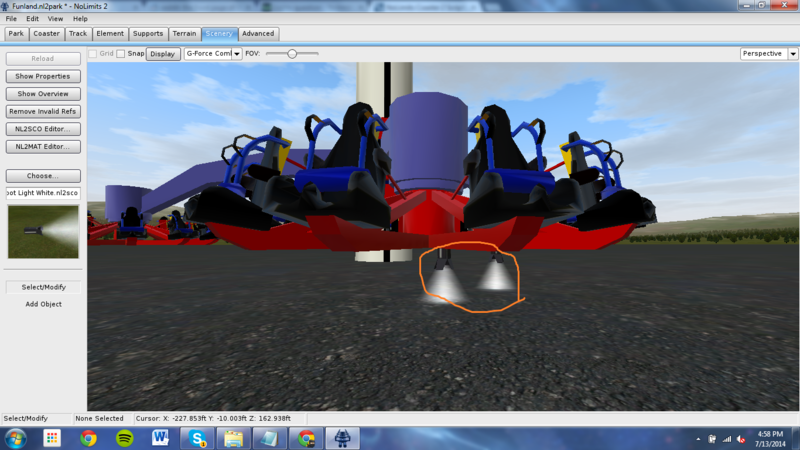 Board index ‹ Roller Coaster Games ‹ NoLimits Coaster 2 ‹ NoLimits Coaster 2 Scripting ‹ Help! I want to bind lights to an animated object! Help! I want to bind lights to an animated object! 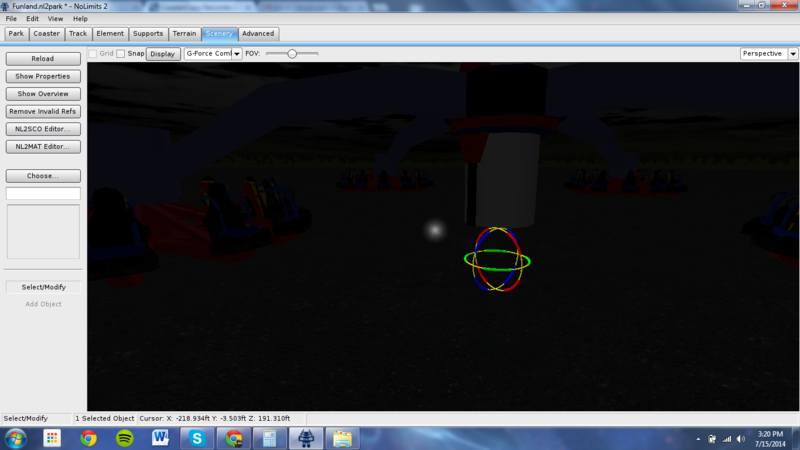 Basically, I have an animated flat ride that I want to include bound lights when the ride vehicle moves on the tower. Cool! The name is Fly Over Rainforest? I was under the impression the name was Green Coaster Goes Fast Goes High Has Clockwise Loop Has Straight Upside Down Four Seats Two On Each Side Fast Coaster? Re: Help! I want to bind lights to an animated object! I am sorry, but I cannot help you on that issue. Are you making a very small park like my Jamp Up Land park? I'm guessing you got inspired by it. If you want to attach lights on a moving object, you have to attach the script with the scripted-move -> to the light. I tried that already with the Gyro Tower and it works. 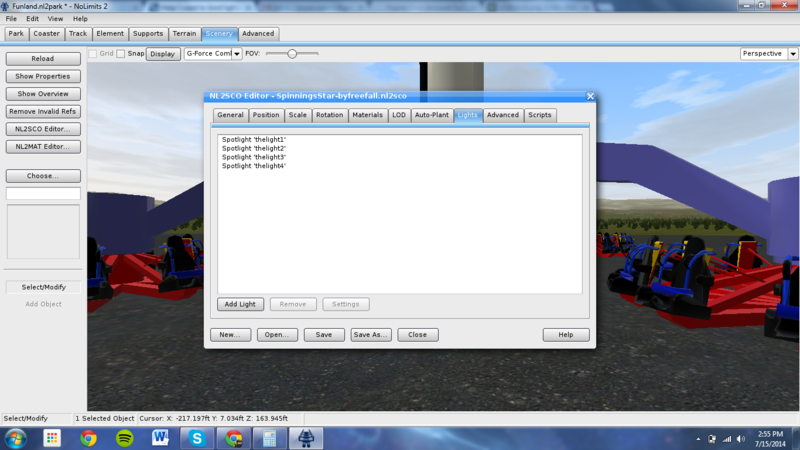 You may have to adjust the pivot/center point of the light-object within the NL2editor. I┬┤ll try that out if it works, i┬┤ll keep you updated!!! Ps. : Thank you for your great tutorial-class session! Spinning Star - SpotLight attachment! This is the first light. To add 3 more lights, you only have to adjust the posX and posZ! The second would be -7,3 meter at the posX window. The third: 7,3 posZ andthe fourth: -7,3 posZ. I named the spotlight "thelight1" "...2,3,4". So it┬┤s possible to turn the lights off during the day circle. I have already adjusted the NL2 "day and night" - light-script for more than one light per object. This is the adjusted script for a quattro-lamp. It┬┤s not ready and i would love if anyone could help me if there is a issue or if it could be easier. But,.. it works! Simply copy&paste this into the win notepad or notepad++ and save it in the "SpinningStar-byfreefall" folder as: QuattroLightScript.nlvm ! After saving, click on the model in the NL2 editor and open the NL2SCO Editor (the model should now be loaded) and go to the Script-Tab. Add here your saved "QuattroLightScript.nlvm" and click on save. Reload the scenery - object aaaaaaaaaaand: It┬┤s done. I followed the instructions, but I'm only getting one small point of light, instead of 4 lights. Edit2: I found my own problem. Edit3: Still having problems. Can You give screen shots for a step by step? I may have missed something. This is the only light that shows up. On the plus side, it moves with the vehicle. As you can see, the second light having the same settings, except the Pos X ...which is now -7,3 meter! 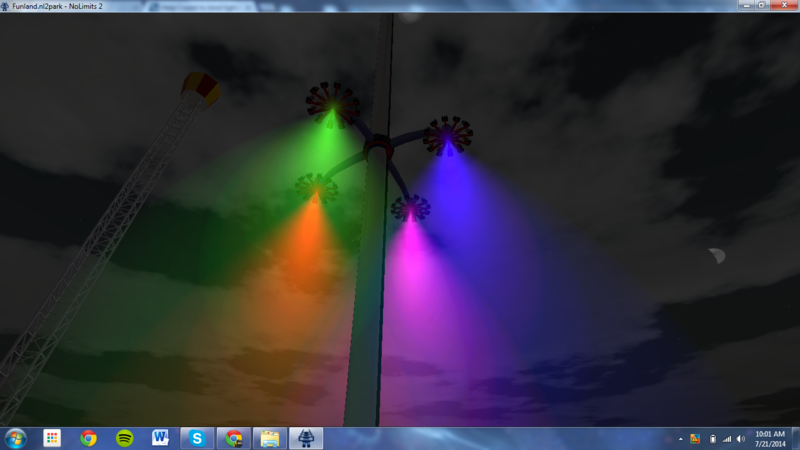 The third light has no settings on the X Axis .. but on the Z Axis! ...at the end, you should have these four lights! - Make sure you have selected the SPOT not Omni-light! - If you have the Spotlight selected .. the window for the spotlight will set the light-settings! I found out by accident that I need to restart NL2 after applying all of these changes. Also, I have the color set as different colors for each vehicle, but they only show up as the color set for "thelight4". Is there any way to fix this? /o\ ...yes it┬┤s the script. It┬┤s not written for multiple colors, since it replaces some materials for the day&night circle. I┬┤ll look into it later to find a solution! Looks really cool! Never thought of that idea but it looks really awesome! Wow! That looks really cool, why hasn't someone done this sooner? Nice job! I┬┤m not a coder or scripter =) Maybe there is a way with less lines and a better solution! As for now, it works! Don't worry, anyone that can make stuff like this is definitely a coder or scripter, don't underestimate yourself. You are easily one of the best scripters for this game out there! Magu, thanks so much for bearing new custom rides and scenery sets! Here I saw your "Super Condor" with the fantastic lights-on! Reminds me of a fiery condor in RCT3! @lol240: Yes, it┬┤s a fantastic idea of NightwindElf! I never thought of that, but it┬┤s looking really great I just have to figure out how the bulps are working so "Tango"lights will be possible in the future =) Would be great to have a small "carnival" feeling on this. I'm learning how to adapt the script for other flat rides! I cant help but feel that lots of smaller lights would be better. It'll be annoying for people in other parts of the park getting blinded every few seconds, like war of the worlds or something. Lots of smaller lights also intensifies the resource use. The light doesn't go as far as you would think, though. Hmm,.. that reminds me of thinking about lights. 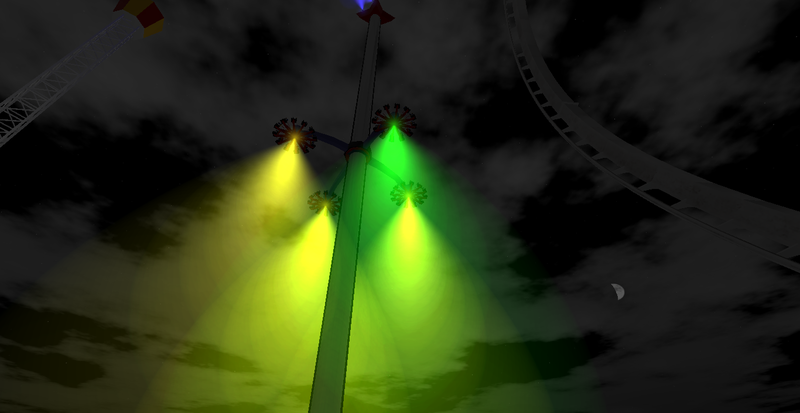 At the moment i remodel the Gyro Swing and maybe it┬┤s a good idea to include some "spots" for lights? Or at least a changeable texture where everybody can make some light-patterns with the Light Pattern Creator for the ride? The lights don┬┤t cost that much ressources.. and are programm-able. But there are no halo-effects like the spot light. Sounds like a good idea to me! Some good spots for lights would be on the spokes of the wheel, and around the bottom of the wheel. Maybe even flood lights at the top of the arm? Regarding the performance issues with lights; apparently the issue is when the light is cast on something, causing the engine to generate brighter surfaces and shadows etc. So if you had a few lights actually doing the illuminating, and let the rest of the lights be "effect only", then this can greatly help performance. ^ Interesting, didn't know that thanks for sharing. What I want to see someone do, Is an animated Hydraulic launch that you can use easily, for the non scripties. Closest thing to that is Kyle Sloane's.